Left to right: Colin Simpson, business development director of Tomlinson Hall and David Lindsay, Nordic Region sales manager – pumps, CRANE ChemPharma & Energy Flow Solutions. 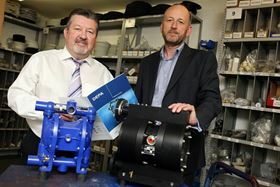 Billingham, UK-based pump distributor and manufacturer Tomlinson Hall is celebrating its 99th year in business by launching a pump scrappage scheme which can help end users save money on the running of older, energy inefficient pumps, and support the UK’s Royal National Lifeboat Institution (RNLI) in the process. Under its ‘99 for 99’ initiative, the firm will give £99 to any company which replaces any old pump on their UK premises with a new DEPA air operated double diaphragm (AODD) pump, which will be supplied by Tomlinson Hall. The firm will safely dispose of the old pump and the scrap value of each pump replaced will be donated to the Royal National Lifeboat Institution (RNLI). Pump users can either take their scrap pumps to Tomlinson Hall’s premises for disposal, or under the scheme, Tomlinson Hall’s engineering team will de-install the pumps on the customer’s site. Founded in 1919, Tomlinson Hall is a global distributor for many leading pump brands and manufactures its own innovative liquid ring vacuum pump, Liquivac. The company offers full-service expertise in pump supply, installation, surveying, servicing and repairs. UK pump distributor and manufacturer Tomlinson Hall has secured a major distribution agreement in Scandinavia for its Liquivac liquid ring vacuum pump. Ian Price will be responsible for building up new sales for Tomlinson Hall to drive business growth in the south of England. Italian pump manufacturer Etatron DS has appointed Tomlinson Hall Ltd as UK distributor for its range of dosing pumps for the process industry. Both variants have either passive or active cooling capabilities. Exhibition for the meat industry. Selwood pumps constantly pump seawater to form part of a warship's fire system. For more than 50 years, World Pumps has been the world's leading pump magazine, keeping the pump industry and its customers informed about all the technical and commercial developments in their industry. We want to hear from you. We’re here to support the creation and sharing of information: if there’s something we aren’t doing, or something we could do better, let us know. We grow through your comments and ideas. Copyright © 2019 Elsevier Ltd. All rights reserved.